Korg's new Minilogue is a fully programmable 4-voice analog synthesizer with a 16-step note and motion sequencer, 8 voice modes, on board tape-style delay, multiple sound shaping and filter options, and an oscilloscope display. 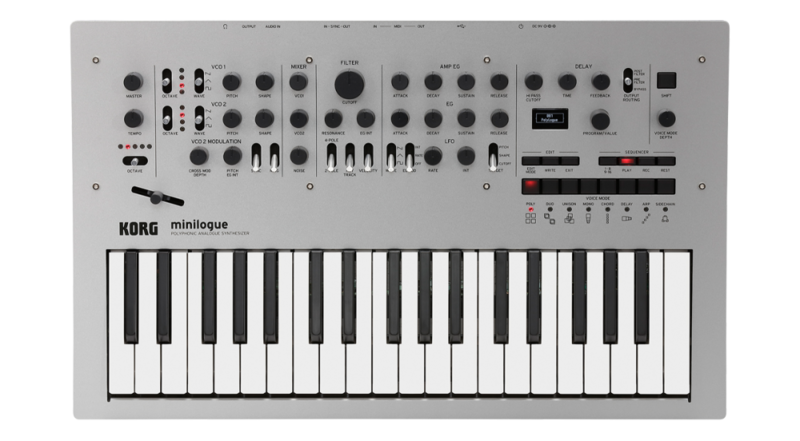 The stylish and innovative Minilogue is 'the' next-generation analog synthesizer - great for any musician looking for a powerful and fun-to-use synth. Dimensions (W x D x H): 500 x 300 x 85 mm / 19.69" x 11.81" x 3.35"
Weight: 2.8 kg / 6.17 lbs. *All product, company, and standard names are trademarks or registered trademarks of their respective holders. *Appearance and specifications of products are subject to change without notice. I am pleasantly surprised at the quality and sound of the korg minilogue. I have heard it sounds thin, but to my ears it sounds great. if you know how to coax bass sounds out of it. I cant say enough about it. Korg did a great job on this one. This synth is a fantastic you and learning tool, a professional synth it is not. The delay is so noisy, it is unusable. The filter is dull. All in all, uninspiring for studio use. Perfect for someone getting into synthesis, there's even an oscilloscope there to see what you're doing to the wave. 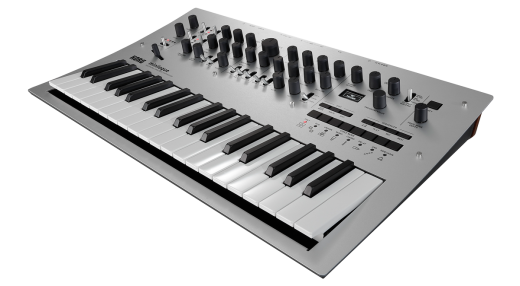 A versatile synth that is a joy to play with and is capable of many sounds. My only gripe is the pitch bend toggle does not seem too tough but as long as you don't go jordan rudess on it all the time it will be fine. Can't get over the sound of this - been playing since the 70s and this is the real thing - no DCOs here. 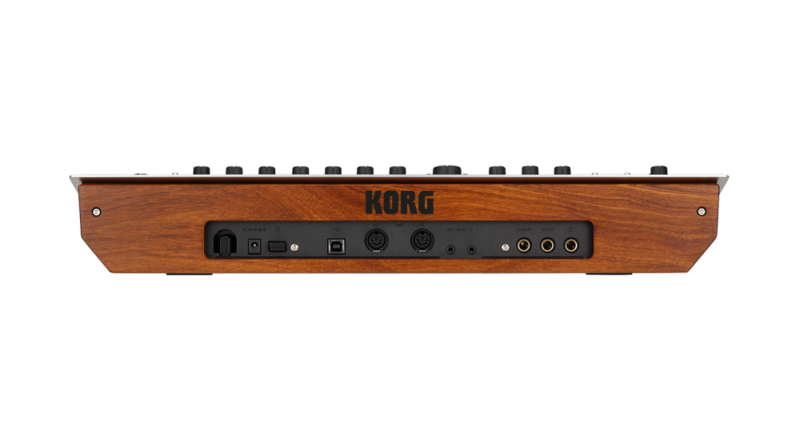 Thanks to Korg for bringing true VCO poly to the masses!!! I've had the Minilogue for about two weeks, and I must say that it's a lot of fun. Right out of the box, I was manipulating sounds and twiddling for hours. My initial comment was that it's the most fun I've had with a synthesizer in years. After spending more time with it I'm starting to think that it's not a keeper for me. First off, I figured the slightly smaller keys wouldn't bother me that much, but unless I'm doing lead lines, I find them restrictive and they require me to look at the keyboard. Secondly, as mentioned elsewhere, the delay is really noisy, so noisy that I can't believe people haven't been making a bigger deal out of it. The overall sound is distinctly analogue and has a character all it's own. It can do some nice deep sounds, but not earth shattering basses. The interface is super easy to used and I think I only looked at the documentation once. I still say it's super fun to play with. 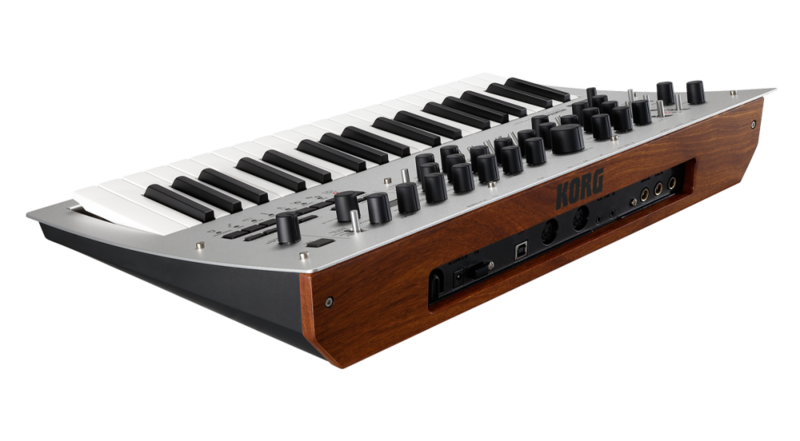 My recommendation, is that if you want an inexpensive analogue synth, and have a decent external delay, and don't mind the small keys (or are going to play through MIDI) then this is definitely the current best best. With this synth, I can get authentic 80s analog poly sounds, for cheap. No more trying in vain to get those sounds with VAs - which really sound thin and static in comparison to this. This synth is taking over because it's true 4 voice poly VCO analog - not a "virtual analog", and is only $699. Unmistakeable sound. Dave Smith's equivalent is double that price, and uses digital DCOs. Way to go, Korg!